SKIPPER Craig Morgan wants teams to fear visiting the DW Stadium as Latics climb League One. Lowly Swindon are next to arrive when the sides clash tomorrow. And Morgan is hoping to lead his charges to not only a 10th game without defeat – but preserve an unbeaten league record at home this term. Latics’ recent run has seen them surge into the play-off places, but Morgan has warned his team-mates not to be fooled by Swindon’s managerial turmoil and position in the relegation places. “We have to take nothing for granted,” he said. “We have to go into the game and make sure we’re strong mentally and physically. They have good players and are a good team and they don’t deserve to be where they are. The last nine games has seen Wigan claim four victories – which has changed the complexion of the games they have drawn according to Morgan. And he stressed making the trip to the DW as daunting as possible for opposing teams is key to keeping the run going. “It can only be a good thing. Teams are going to come here and fear playing Wigan which is what we wanted,” he said. “We want to keep our home form going – it would be great to be unbeaten at home. “The draws we could have won the games so that was a positive we were taking out of it. The wins we’ve got make the draws better results. 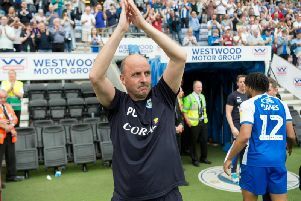 Morgan also thinks the nature of recent results has shown Latics are capable of achieving their pre-season target of promotion back to the championship. “Any team that goes nine games unbeaten – it shows the team has got something,” he explained. “If you’re going to get promoted - there are times you’re going to be behind and people peg you back and it’s what you do from there.